The Silverstep is a Roll-Up banner stand the provides durability and large image area in a modern design. The 15 lb. base gives the system a heft feel while the spring tensioned roller keeps your print tightly aligned. 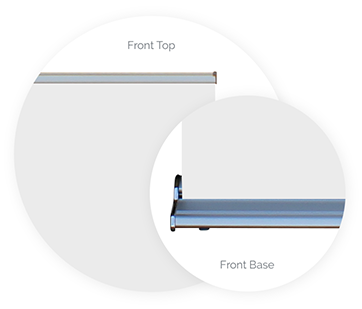 Printastic recommends and supplies 36"x81" high banners, however the Silverstep's adjustable support leg makes varying display heights possible. 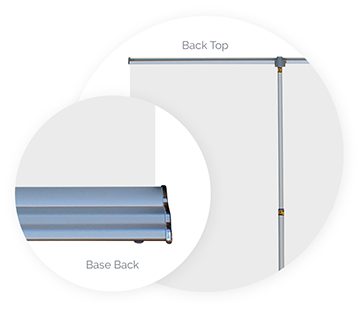 Your banner attaches to the leader strip inside the Silverstep banner stand with Velcro Brand Hook & Loop Fasteners, which provides the flexibility to change the banner from event to event. The Silverstep arrives at your door with the printed graphic preinstalled and is presented in an attractive gray fabric travel case. The Silverstep's travel case offers handles on the top and sides, has a detachable and adjustable shoulder strap and has reinforced corners to ensure damage free shipments. The Silverstep Banner Stand from Printastic makes big messages easy to impart. Since your banner arrives preinstalled, simply extend the banner from the base, insert the adjustable support leg and start attracting attention!